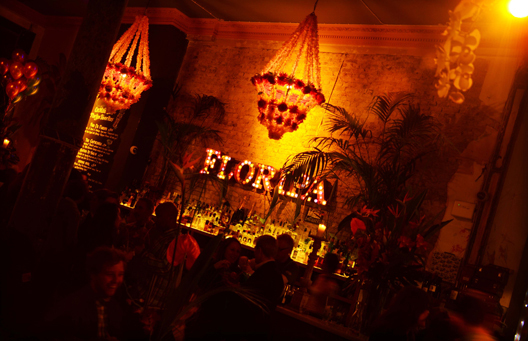 Floripa has gone through many changes over the years, from seedy house of debauchery, to carnivalesque party venue, to what it is today. Floripa still has a good vibe and a party atmosphere, but a half a year after the last time I was here, things have changed a bit. On the cocktail side. It’s still a large open plan space with an outdoor area and a stage for both bands and DJs, with large groups of people coming in for dinner and drinks. Beginning with the Fogo de Floripa: Cachaca, pomegranate syrup and far, far, far too much Temepero Baiano (a spice combo much like the Indian garam masala, where every family has their own combination of various spices. This was pretty much plain cinnamon, maybe nutmeg as well;). The result was, in a word, obscene. Chokingly sweet, no one at the table could ingest this. So sweet that it didn’t taste of anything. Regrettable in every way. 6 months ago, Caipirinhas over here were actually pretty good. Recently things have taken a turn for the worse. We thought, hey, the last time we got decent ones, and how can one mess up a Caipirinha? It’s a Brazilian venue after all. The Velho Barreiro Cachaca muddled with lime and sugar just came tasting of artificial flavouring and refined sugar. Just. No. Whereas this venue is great for parties, I wish I’d be able to drink something. I was also more annoyed by the general attitude of the venue, making it a headache to book spaces using bank detail etc., it ain’t Claridges. It just ended up feeling like such a waste. Service was alright, nothing special, but not bad, either. Next time I have a cachaca craving, I will remember to go back to Made in Brazil, Camden Town (Review HERE). This entry was posted in Bars & Cocktails and tagged Bar/Restaurant, Brazilian, Easy-going, Food, Old Street, Party, Shamelessly Drunk, Shoreditch.